Does the statement above sounds familiar? Does it happen to you too? This is one of the most frequently asked question posed to me when it comes to astrology. Those whom have been following my site since the beginning would have knew how to improve on this problem in terms of boonyarit ways. 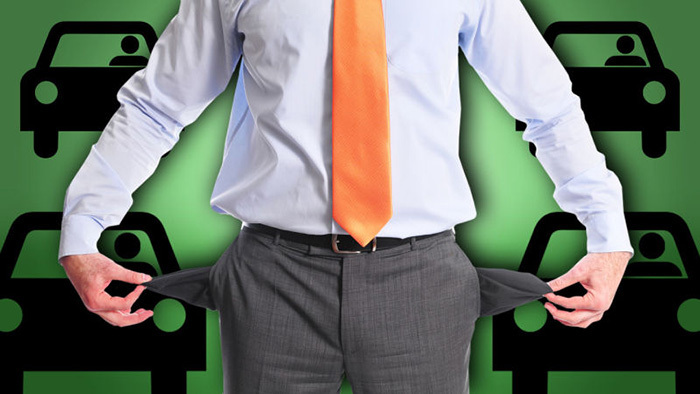 Let me now share with you one of the ittirit ways to help overcome and improve money problems. 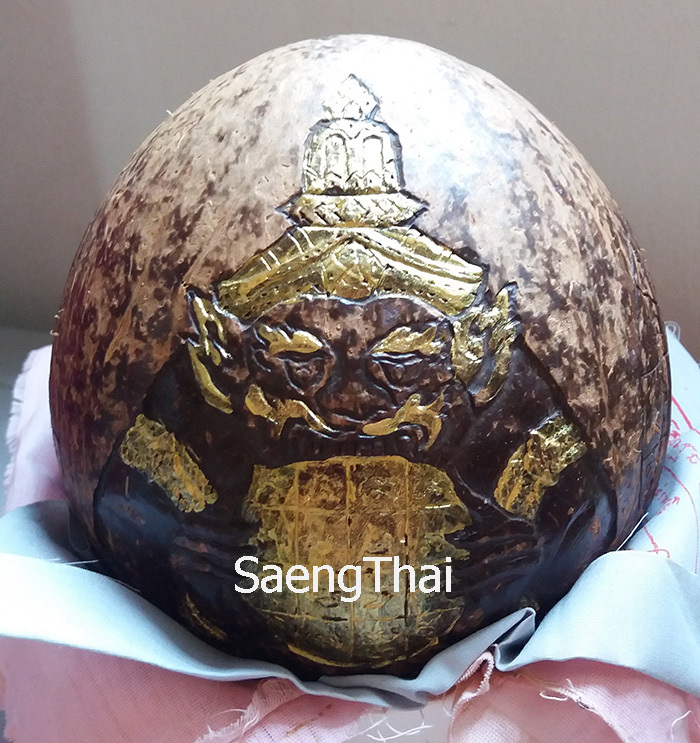 This is an image of Phra Rahu crafted from Kala Mai Mi Tha ( my personal, not for sale ). 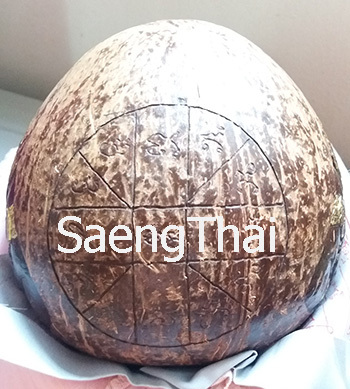 Kala Mai Mi Tha means no-eyed coconut. In Vedic astrology, generally a person with his Second Bhava (House of Income) being afflicted by Phra Rahu will have the above problem. 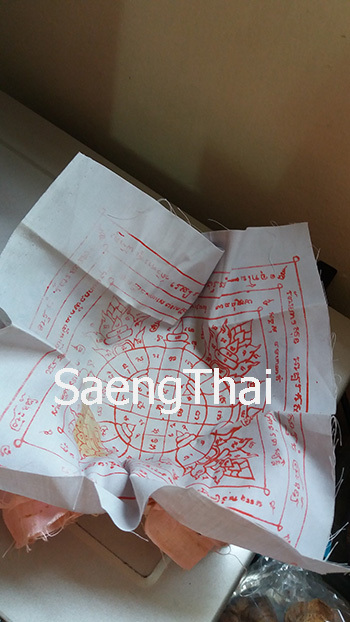 Therefore we collect a pair of coconut, singled-eye and no-eyed coconut, then request a Gaeji Archan or Karawat whom is specialized in consecrating Phra Rahu (not every Gaeji can) to craft the image of Phra Rahu and then inscribe or engrave the necessary yants on it. 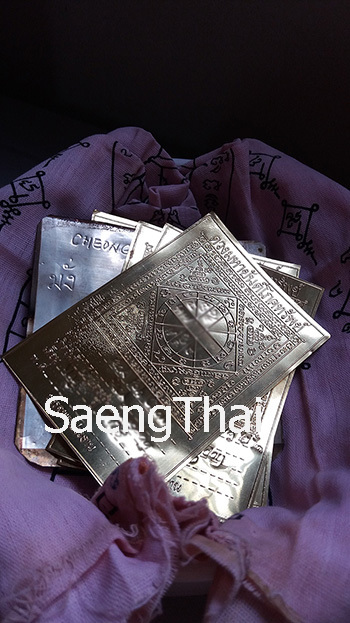 After ploksek, then invite both the Phra Rahu and revere at your altar. Those friends whom I have brought up with me on my trips to collect the coconuts were the lucky ones because its still attached to the husk. They have seen it the actual thing. these days everything can be made to look real, even such coconuts. 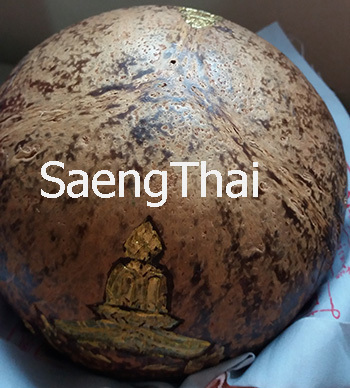 Place your yant duangs into the holder and some auspicious yants on top of your yant duangs, then place the Phra Rahu coconut on it. There are a set of kathas to be chanted, these rahu kathas aren’t the usual ones you can get on the internet. If you can regularly perform the prayers with great devotion, you can see for yourself.